Android 9 Pie is finally available for the Samsung Galaxy Note 9. After a beta phase lasting several weeks, the Android update has rolled out with the new One UI interface. You can see which providers have already delivered the update on and which new functions are waiting for you. This has been clear for quite some time: Samsung's top smartphones from 2017 and 2018, the Galaxy S8 and Note 8 families, as well as S9 and Note 9, are to receive the update to Android 9 Pie with One UI. Beta tests have already given us an impression of the new user interface. However, the performance was still raw and even occasional crashes plagued the pre-release version - predictably. This should now end with Note 9. This is what we hope for since Samsung is now distributing the final version of Android 9 Pie for the smartphone with the S-Pen. Owners of the Samsung Galaxy Note 9 can count on the delivery of the corresponding system update in Germany with immediate effect and thus catch up with the owners of the Galaxy S9. They got the Pie update at Christmas. The update should come to Note 9 users worldwide very soon. 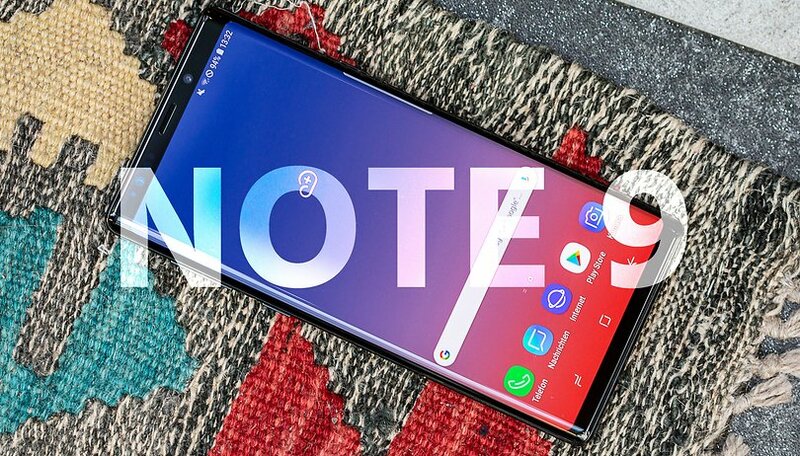 Owners of the Note 9 will still have to be patient for a few days, at least in Germany. Not only because Samsung distributes the Android update step by step to the phones in circulation. Models purchased from providers will also have an additional waiting period until Telekom or Vodafone have tested their carrier add-ons in the new software version and released the upgrade. Those who bought the branding-free Galaxy Note 9 from 1&1 or Telefónica will probably get the Android update earlier. Currently, the system upgrade for the Note 9 is only available for download as an OTA update. A manual installation via ODIN is not possible due to the lack of a corresponding OTA-Zip, SamMobile says. What does the Android update on the Note 9 bring? In addition to an update to security patch level in January 2019, this time the 1.6 GB software update for the Note 9 contains new functions and a new software interface. We analyzed the so-called One UI more closely in a separate test. You will notice significant changes in the layout of menus designed to make it easier to use your smartphone with one hand. A night mode finally makes menus uniformly dark. Buttons in the quick settings menu are transformed and you can display your home screen icons without labels. Later there will be a time control for the mentioned night mode as well as a Pro mode for video recording, SamMobile continues. Will you be downloading the update? Let us know. HELP!!! I just downloaded the latest version for my Note 9 (15 Mar 2019) and it completely hosed my phone. My entire contact list is nothing by blank boxes, when I make a call there is no "end" button to press to end the call (I have to depend on the other person to hang up before I can use my phone again), all my texts are completely co-mingled in with each other based on their timestamps (NOT by name!!! ), and there's no way to see who's who because there's no way to identify each text because there's no contact list to refer to. I called Verizon but they're not willing to help because it was a SAMSUNG upgrade, and Samsung is not willing to revert me back to Oreo, so I have a brand new, very expensive phone that's nothing but a paper weight. DO NOT UPGRADE TO THE UI 1.0....it'll completely hose your phone!!!!!! I called Samsung at the beginning of the month and they told me I would have the update on February 11th. It's now the 14th and I still don't have it. Why is it taking so long for note 9 to get this. I'm also on December security patch seems like I already need a new phone. I have unlocked note 9 using on T-Mobile and still don't have January update. Still on December. It's awful. When is this coming to the Note 9 on TMobile in the USA? Everything says this should have been released in January. I don't see it on my phone and it's February?